In this brilliantly illuminating group portrait of the men who came to be known as the Founding Fathers, the incomparable Gordon Wood has written a book that seriously asks, "What made these men great?" and shows us, among many other things, just how much character did in fact matter. The life of each—Washington, Adams, Jefferson, Franklin, Hamilton, Madison, Paine—is presented individually as well as collectively, but the thread that binds these portraits together is the idea of character as a lived reality. They were members of the first generation in history that was self-consciously self-made men who understood that the arc of lives, as of nations, is one of moral progress. Gordon Wood has distilled a large body of knowledge into cogent chapters on the founding fathers, bookended by essays that put their legacy into perspective. What he tries to do is peel away the layers of mythmaking and revisionist history that have taken place over the last two centuries and get to the heart of what made these "revolutionary characters" tick. What he reveals is that it was their strong sense of public character and duty that separated them from not only the mainstream of their time but the mainstream thought that prevails today. Wood argues that you cannot separate the Founding Fathers from their era, they lived under a very different set of circumstances, and responded to these circumstances in their own unique ways. Since so much of their writings and journals have survived down through the ages,it makes these early statesmen prime subjects for psycho-analysis, but what Wood tries to do is take the position of an observer, looking into their conduct as one would in the late 18th and early 19th centuries. While a ranking of their conduct can more or less be inferred by the order of the chapters and the way Wood assesses their individual characters, the author stresses the pivotal roles each had in shaping the United States. Washington is paramount in the way he was able to balance all these competing forces in his presidential administration. He was a leader, if not necessarily a "decider," capable of weighing the opinions of his administration and reaching what he regarded as a just and due course for the nation. He may have lacked the intellectual abilities of Jefferson and Hamilton, or the judicial acumen of Adams, but he didn't seem to second guess his decisions, sticking by them and accepting the consequences like the gentleman he saw himself as. While this may have lent him a stiff air he was so respected in his day that the deification of his role in the American Revolution had already begun by the time of the Constitutional assemblies. If he was reluctant to assume the role of President, Wood argues it was because he did not wish to become king, which was the way many leading figures were projecting him at the time. Franklin and Adams were less concerned with how they were viewed by others, but they too cultivated public characters that served them well throughout the revolution. Both saw politics as a form of theatre, and as such perception was as important as the reality of their actions. Franklin seemed to be the more optimistic of the two, whereas Adams was deeply worried about the balance of government, something which Wood says gave Adams no rest throughout his lifetime. This could also be said of James Madison, which Wood devotes an excellent chapter to, showing how he was misinterpreted both in his time by his fellow statesmen, and later by historians. It is largely viewed that Madison underwent a major change of heart in the 1790's from that of an ardent Federalist to an anti-Federalist over the role the federal government should play in the United States. But, Wood argues Madison never saw the federal government as anything more than an adjucator, resolving state disputes, not governing over them. Here is where Madison differed sharply from Hamilton, who believed strenuously in a strong federal government, to the point of being an authoritarian regime, which in many ways the early Federal government was. Wood even devotes a chapter to Thomas Paine, the most democratic-minded of all the early statesman, and perhaps the most "revolutionary." Paine's role in the revolution is often overlooked because he did not serve in the federal government. However, his pamphlet "The Rights of Man," was one of the key documents of the revolution and perhaps the most far-reaching. 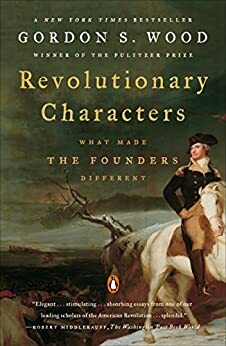 In a time when many persons, both historians and politicians, are reassessing the Founding Fathers, it is refreshing to have a book like this, which strips away all the attempts to make these "revolutionary characters" into mythological figures and views them within their 18th century context. "Revolutionary Characters" is more of a teacher than a book, highlighting in the most balanced manner the common streak of excellence that characterized the Founding Fathers. It was their character that outshone all others accomplishments. The beauty is that all those larger-than- life characters were humans like us, most of them not born with a silver spoon in their mouths, carrying the kind of dreams and desires shining like stars in our eyes, but what took them to the ultimate heights was their sincerity, honesty, linkage with the people and stead-fastness of purpose. it is a book that must be on the shelf of those who are honest seekers of improvement, betterment and growth, in themselves as well as in those that surround them. Thank you Mr. Gordon S. Wood, for writing such a readable book. Gordon Wood is one of the finest historians who writes scholarly works which are readable and catch the tone and essence of the Ameican Revolutionary period. I purchased a copy based on the recommendation of Zareed Zakaria on CNN. He strongly suggested this read for those interested in the period and the "founders". I enjoyed the comparisons and in-depth research. A must read for the follower of this period of US history. A good length, not too long! Captures the key focal points of each founder.